Jenny Jenkins has provided this photo: 'The couple to the right of the photo are my grandparents Alice and Arthur William Burrows, (the people to the left are a mystery: please get in touch if you can identify them) it appears they are celebrating the Coronation of George VI 1937. Alice and Arthur Burrows had five children, four boys and a girl, my Mum Gladys Irene Edith Burrows. 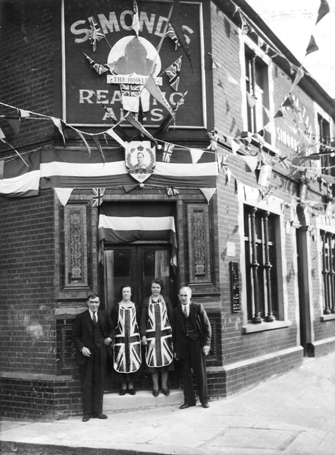 In 1920 they lived in Pears Road Hounslow, 1937 & 1938 The Royal Tar (3 High Street) Brentford. 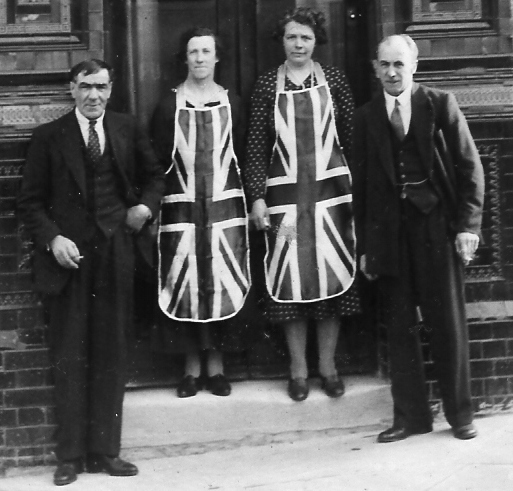 They must have left by 1940 as Tom Hills is then landlord of the Royal Tar. They went on to run The Royal Oak in Addlestone Surrey during the war years till 1951 when Arthur died. I would love to know anything about the family during their time in Brentford good or bad! The photo shows the position of the Royal Tar on the corner of The Hollows, the High Street runs to the right. Simonds Reading Ales with their hop leaf trademark is advertised above the door.